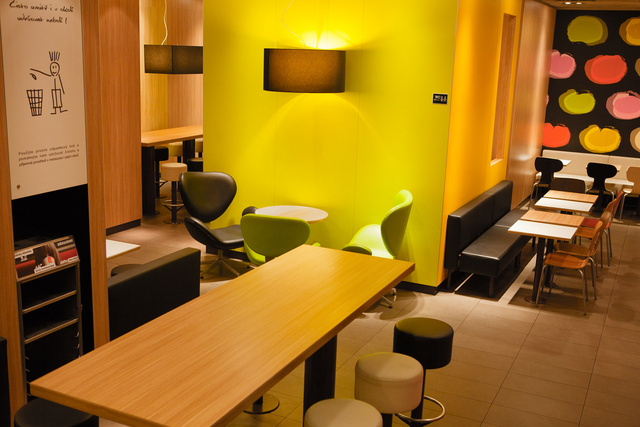 McDonald's interior in Prague New City. If you click to zoom in on the images, you can see comparative prices (19.5 Czech Crown = 1 USD), though local salaries are a bit lower than the US also. This entry was posted in Uncategorized and tagged McDonalds, pastries, travel. Bookmark the permalink. Last time I was in Praha (2002ish) I don’t remember there being too many McDonalds, or Starbucks thankfully. Although I tried to avoid an American fast food while overseas, I’m glad you got these shots, it’s an interesting contrast. 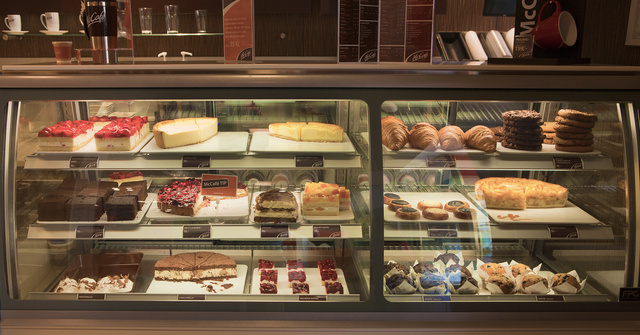 Here in the States, that would be the interior of a Panera or similar coffeeshop. McD’s could increase their market share here if they offered such amenities. Instead, you usually find dirty Formica and employees who think “hygiene” is a greeting. All other McD’s I’ve seen in Czech Republic look different, and much like the US ones. This one looks just like another coffee-shop for tourists..
McDonald’s are fortunately not as common as in the US. For the price of a meal in McD’s, one can buy a regular meal in any pub or non-tourist restaurant. Very few people receive salaries. Wages are lower, median is ~ 800$ after taxes a month. I’ll be in Prague next month, I’m really looking forward to it! Somehow, however, I doubt I’ll end up in a McDonalds.